News | Asian Shakespeare Association Biennial Conference "All the World Is His Stage: Shakespeare Today"
Asian Shakespeare Association Biennial Conference "All the World Is His Stage: Shakespeare Today"
There is no doubt that Shakespeare has occupied the stages of the world: his works are read, translated and performed in most languages of the world. Intercultural and intermedial appropriation is the order of the day, his works continue to issue forth in protean and surprising forms. The world has embraced Shakespeare as no other author before or after. He inhabits all literatures and cultures. 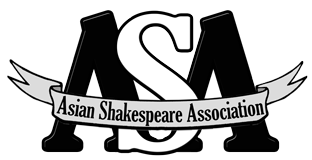 This conference would like to celebrate, document and debate this world-wide spread of Shakespeare: how and why do people continue to recourse to his plays and poems? What meanings do they make more than 400 years after they were written? Are these versions of the same Shakespeare or do both local and global Shakespeare exist simultaneously? Is it possible or even desirable to reclaim our man from Stratford? Please send a 250 word abstract with a short bio-data by 31 May 2016 to admin@asianshakespeare.org.